Benchmark indices made new milestones in March with the Nifty hitting the 9,100-mark and the Sensex moving past 30,000 levels for the first time. There is no doubt that the breach of the psychologically important targets comes with a mix of excitement, anxiety and fear. Since then, the markets saw some bit of profit taking on concerns over weak corporate earnings and sooner than expected interest rate hike by the US Federal Reserve which weighed on sentiment and resulted in correction of nearly 10% during last 2 months from all time high of major indices - Sensex and Nifty. Excitement is understandable given the dream run in the equity market. The benchmark indices have gained close to 75 per cent each in an 18-month long one-way rally from the bottom of August 2013. As illustrated in the table above, average returns (as on date) of Hidden Gems stocks recommended in 2014 is 52.6% compared to small cap index average returns of 23.4%, Hidden Gems out performed small cap index by 29.2%. Our top performing Hidden Gems of 2014 were Atul Auto and Flex Food, these stocks have achieved their target price giving more than 100% in period of 9 to 12 months. 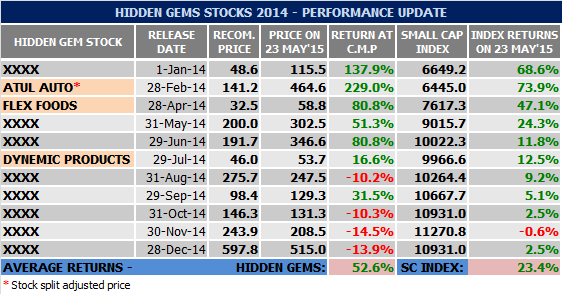 Our Value Picks stocks of 2014 also outperformed Mid Cap Index. Average returns (as on date) of our Value Picks stocks is 34.5% compared to average returns of 19.1% of mid cap index. Our top performing Value Picks of 2014 are Mindtree and Bajaj Corp, these stocks have achieved their target price giving returns of 109% and 85% respectively in period of 9 to 12 months. Our research team has not released Value Picks for couple of months in 2014, hence total recommendations are less compared to Hidden Gems. However, more important is to ensure that we suggest you to pick the right stock ensuring that you get handsome returns on your investments in medium to long term. We also take this as an opportunity to inform our readers that our Combo - 2 (Annual subscription of Hidden Gems, Value Picks and 15% @ 90 Days) is the best selling subscription service at Saral Gyan, we have registered maximum subscription of Combo 2 since beginning of this year followed by Wealth-Builder (an offline portfolio management service). Subscribe to Hidden Gems & Value Picks and start investing systematically in fundamentally strong small and mid cap companies in 2015 to get rewarded in long term. Avail attractive discounts by subscribing to our combo packs, click here for details. On activation of your subscription, you will also receive our recently released Special Report - 5 Stocks - 5 Baggers in 5 Years. Click here to know more about our Special Report.